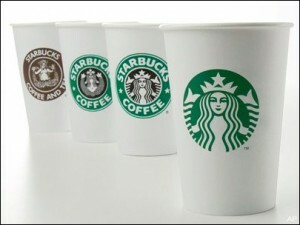 Marketing Elements by Timothy Goleman - Starbucks’ New Logo: Branding Blunder or Genius Maneuver? This week, coffee titan Starbucks did something it hasn’t done since 1992. It changed its logo. But that wasn’t the biggest story. The biggest story was that the brand removed its trademark “Starbucks Coffee” wordmark that has encircled the centerpiece of the logo — a siren — since 1971. My first thought was: “This was a very wrong move for Starbucks. They have just wrecked their iconic image — one that they have been building steadily for the past couple of decades.” I questioned whether anyone would be able to tell that this new logo represented Starbucks, and more importantly, that they would even recognize it. Now, don’t get me wrong. I realize that one of the truly significant leaps a brand can make is to move to a wordless logo. But even more so, I realize that in order to do so, a brand has to be ready — meaning, the public has to be ready to embrace this logo. Apple has done it successfully. They have built a culture around their trademark white apple logo. But that’s because the company’s name is an apple. The same goes for Target. But, how does a siren represent Starbucks Coffee? Surprisingly, when I polled a random sample of 20 people, much to my chagrin, all were able to recognize it as Starbucks. Even more surprisingly, although they recognized it, they were also fairly confused as to why it was done and still were unsure of how this siren represented the brand. Whatever the case is, the general consensus seems to be one of acceptance, but not one of loving embrace. Starbucks’ reason for its logo change was to get away from being seen as a coffee brand, and to expand a bit more on its products and culture. Yet, one of the essential elements to smart marketing is never to spread your brand’s image too thin by expanding too far and losing sight of what made your brand iconic in the first place — in this case, coffee. What will remain to be seen is just how this new expansion will affect Starbucks’ branding. It’s completely bold and daring, considering Starbucks is known as the juggernaut of coffeehouses, but it could just work if the brand’s marketing department is smart and play their cards right. What do you think of Starbucks’ new logo change? Steven Le Vine is founder and president of grapevine pr (www.theprgrapevine.com), an L.A.-based full-service lifestyle and entertainment PR firm, currently celebrating five years in business. Le Vine is a graduate of William Paterson University in Wayne, N. J., where he earned a B.A. in Communication. Le Vine resides in Los Angeles, CA.